Cappy’s Dry Rub ‘Salt Free’ variety is the same flavorful recipe as the ‘Original’ without the sea salt and no salt substitutes added. Have you experienced salt free products that are bland, flavorless or taste like cardboard? Cappy’s ‘Salt Free’ comes to the rescue. Marinade for all Meats, Poultry, Seafood and more! 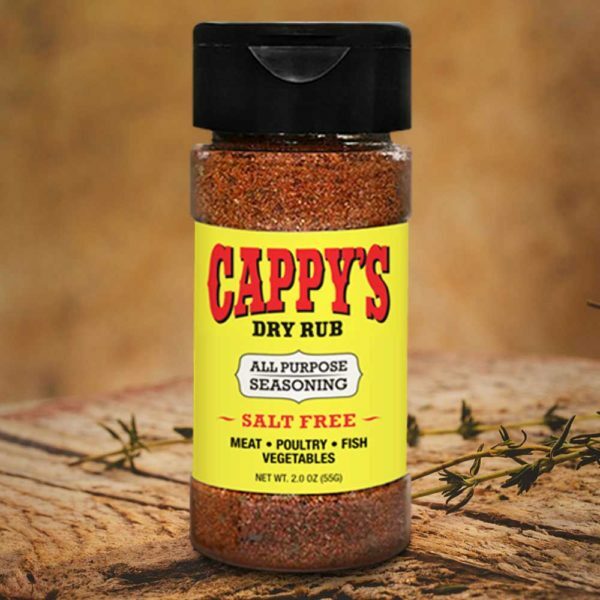 Cappy’s Dry Rub ‘Salt Free’ variety is the same flavorful recipe as the ‘Original’ without the sea salt and no salt substitutes added. Have you experienced salt free products that are bland, flavorless or taste like cardboard? Cappy’s ‘Salt Free’ comes to the rescue. Because its a blend of 11 herbs and spices, it’s truly all purpose. Its also delicious on poultry, seafood, or any kind of meat. Enjoy making soups, stews, chili or sauces but are concerned with the amount of sodium? Just add Cappy’s ‘Salt Free’ to enhance the flavor of your dish without increasing the salt content. Anyone can enjoy Cappy’s ‘Salt Free’ not just people with high blood pressure or hypertension.